Split testing (A/B testing) will help you fine-tune your campaign by distilling exactly what it is that drives your audience to take action. NOTE: This article covers creating a new split test in our redesigned split testing tool, available to Pro-level subscriptions and above. Running a split test can be a great way to optimize your pages for conversion. If you’re new to split tests, you may want to read our blog post here: From Curiosity to High-Conversion: A Guide to A/B Testing Your Landing Page. Below, learn how to create a new split test with our tool. … among other variables to optimize your pages. TIP: For best results, we recommend limiting each test to one or two variables—if you test too many changes at once, it’ll be difficult later on to determine which exact change resulted in increased conversions. When you know what you want to test, it’s time to set up your pages. If you already have at least two published pages you want to compare, you can jump ahead to steps for creating your test. WARNING: You will not be able to publish your split test if you have more than ten pop-ups total between your control and variation pages combined and/or your pages have not been published. Choose a page (or create a new one) that will act as your control—that is, the page that will serve as the baseline for your test’s analytics—and make sure it’s published. If you plan on comparing different templates, you’ll need to create and publish your variation page before setting up your test. If you plan on comparing smaller changes between pages using the same template, you’ll be able to create you variation(s) as part of the test setup process. NOTE: Our tool doesn’t limit what you test or compare—you can freely create a split test that compares entirely different pages if you like. To keep track of your test’s pages, you may want to name them so you can identify each variation (and perhaps add a “split test” label). Navigate to the Lead Pages tab in your account, then click the Create New Split Test button at the upper-right corner of the dashboard. Name your test by hovering over its placeholder title in the top bar (as shown below). In Step 1, browse your list of pages and click Use This Page to set your test’s control page—against which any variations will be compared. NOTE: Each test can only have one control page. To change it, click Choose Control from the left-hand sidebar and choose a different page. On the variations page, click Add a Variation, then choose whether you’d like to copy your control (to test small changes), or use a different page entirely. If you copy your control, you’ll need to edit and publish the new variation to use it in your test. Click the pencil icon next to the variation title to edit it in a new tab. Click the Next ➔ button in the left-hand sidebar once you’ve chosen your variations to decide how traffic should be distributed to them. When people visit your split test’s URL, we’ll automatically direct them to a variation based on the traffic percentages you choose here. Pro tip: If your control page is already solid and working well for your needs, you might consider sending more traffic to it than your variation(s). That way, you can run a test without a high risk to your conversion rate. NOTE: Visitors who return to your test won’t randomly see another variation—we store which version they landed on as a browser cookie, so each individual will only see one page in your test under normal circumstances. Keep in mind, you may not see your split test’s individual page views match up with your traffic distribution right away. It’s helpful to think of these settings as a weighted coin or die—you’re choosing which page(s) visitors are most likely to land on. WARNING: Once your split test is running, you won’t be able to adjust its traffic distribution. Click Next ➔ to move to the fourth step, where you can finalize your split test. Review your test to make sure everything looks good to go, then click Start Test (or save it for later). 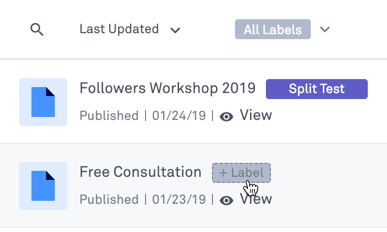 NOTE: A split test will start with blank analytics, however, after ending and deleting a split test, all pages in the test will be separated and placed in draft mode with their original analytics. To learn about actually running your test, check out Running a Split Test.